26 January 1941. 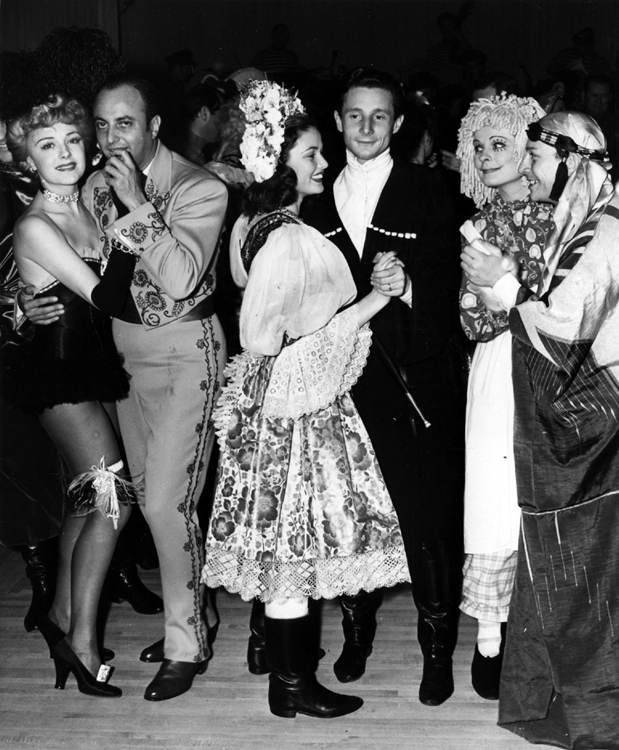 Gene Tierney, dancing with Oleg Cassini, exchanges smiles with actress Ruth Hussey (dressed as a rag doll) and producer Raphael Hakim (a sheik), reputed to be her fiancé. Ruth, a philosophy and acting graduate, worked as a fashion commentator for a local radio station and as a model for the Powers agency in New York. After winning a series of roles with a number of touring companies, she was signed by MGM and made her screen debut in 1937. Last year she was nominated for an Academy Award for her turn as a cynical photographer in The Philadelphia Story (1940). She will continue to star on the big and small screens until the early 1970s. But her relationship with Hakim will come to nothing – next year she will marry Robert Longenecker, a successful Hollywood manager, with whom she will have two sons and a daughter. To the left of Gene and Oleg are Virginia Field and Bill Josephy. Bill is a friend of Oleg’s and in just a few months’ time will act as his accomplice by chartering a plane to take the couple to Las Vegas to get married. He will be best man. She was, and is, the only actress I really dislike. She was sickeningly sweet, a pure phony. Her two faces sent me home angry and crying several times. The party at which this photo is taken is covered in the 17 February 1941 issue of LIFE magazine. In Hollywood, Jan. 26, more than 200 movie stars, press agents and publicity buffs disported themselves at a fancy shindig that offered everything the U.S. fan ever envisaged in the way of a Hollywood party. It took place at Ciro’s. Guests came in opulent costumes, glamorously obtained by raiding studio wardrobes. Dorothy Lamour’s famous contours were present. An Earl Carroll girlie named Beryl Wallace bounced pinkly about the floor in one of the least constricting ensembles ever seen on a January evening. Champagne burbled in high tidal abundance. And the whole affair was hosted by a gentleman whom most of the guests knew virtually nothing about. The question “Who is Rex St. Cyr?” kept gossips busy all evening. It was persistently reported that mysterious Mr. St. Cyr was once plain Jack Thompson of Waco, Texas: a onetime newsboy, onetime chorus boy, who married a wealthy widow and inherited $40,000,000 when she died. No one knew what he was doing in Hollywood. No one cared. No one knew exactly why he gave the party– though it was formally dedicated to Cobina Wright Jr. and appeared to be a sort of unofficial debut for her. But virtually everybody who was anybody was there. To no one did Mr. St. Cyr’s hospitality bring a greater enjoyment than to Juanita Stark, 19-year-old “find,” whom a Warner Brothers scout had spotted on Monday, Jan. 20, as she drew $10 from a relief office in Los Angeles. Screen tested Tuesday, she received a contract Wednesday.